Death and dying is the one subject no one wants to talk about, but we must. We need to think about how we want to live at the end of our lives; what’s important to us; what we value. And then we have to tell our loved ones and our medical team so they will know how to care for us if we cannot speak for ourselves. I’m sure you’re as sad as I am, on hearing the news about Jeopardy’s Alex Trebek’s Stage IV pancreatic cancer diagnosis. Can we even imagine Jeopardy with someone else? Well, apparently, Alex can’t either because he’s vowed to “fight this” and “beat it,” and make good on the remaining three years of his contract. But I’m sad too, at his reliance on the kind of terminology that seems to infect so much writing about serious illness. It’s a battle. No, it’s a war. You want to win it. Here’s what comes from seeing illness through that lens: if your disease progresses, does that mean you’re not fighting hard enough? If you’re too tired or even grumpy to be positive and put your best foot forward, does that mean the disease is winning the battle? And if your family and friends are urging you on to keep fighting, does that mean you’re disappointing them and that it must be some character weakness in you, if you just don’t want to? Illness can be unpredictable, wily and complicated. It is not necessarily amenable to your strength of will and your determination to overcome it. Instead, how about dedicating yourself to treatment, doing your best to eat, sleep and live as well as you can for as long as you can? I would have liked to have heard that from Alex. I also think he has a great opportunity to teach his audience about the nature of serious illness, the shock to the system, the ups and downs, the complications, the satisfaction of good days. And how great would it be if he sent out another message, telling us about his advance directive, and why he made the choices he’s made? So I wish nothing but successful treatment ahead for Alex, and at least another three years on that contract. But please, no more war metaphors! Had a wide-ranging conversation about how the media portrays (or doesn’t) elders, serious illness; how people misunderstand palliative and hospice care; and lots more on Barry Lynn’s “Culture Shocks” podcast. You can listen to our half-hour conversation in the second half of the podcast. We are now in the midst of the 2019 film awards season, after the kickoff of the always amusing and entertaining Golden Globes. It reminds me that for some time, I’ve longed (in vain) for some kind of media awards event for accurate portrayals about late life. But to whom would those awards go? Alas, few recent films and TV programs might qualify.in late life, frailty, illness, death, loss and grieving don’t translate into blockbuster ticket sales. I should tell you that I feel that animated films and television programs can have more artistry, humanity and complex storytelling than many conventional live-action films. I’m a huge fan of the Toy Story films, Inside Out and most recently, the brilliant Isle of Dogs, for example. I’m also a huge fan of Bob’s Burgers on TV. But right now BoJack Horseman is probably my favorite. This Netflix series chronicles the “Hollywoo” (that’s what Hollywood is called here) life of BoJack Horseman, a self-loathing and depressed former TV sitcom star, voiced by the actor Will Arnett. The premise of this world is that a dizzying variety of anthropomorphic creatures interact easily and regularly with human beings. BoJack’s agent, for example, is a cat, Princess Caroline, voiced by Amy Sedaris. The show is by turns hilarious, bitingly satiric, poignant and occasionally moving. “Free Churros” is a stunning example of the latter. It consists of a 20-minute monologue by BoJack, who is delivering a eulogy to his mother. It is more of a stream-of-consciousness and it artfully suggests why BoJack is as self-involved, troubled and self-destructive as he is. This is what struck me: Loss and grief are so much more complicated for those who have had strained or stormy relationships with their parents. There’s so much unfinished business. So much anger and resentment on top of the heartache of feeling a void that will never be filled. BoJack clearly had a fraught relationship with his mother (and an even more difficult relationship with his father). This episode beautifully captures all of pain and ambivalence about losing a parent in these circumstances. And still manages to end with a very clever joke. I think it’s hard to prepare an advance directive if you don’t know precisely what some measures – like cardiopulmonary resuscitation (CPR) – really entail. Most of us have a general idea, probably from watching heroic and often extremely successful CPR episodes on our favorite medical TV shows. And using that as our guide, we might reasonably think, why not opt for that? There are plenty of reasons why not, in fact. But it’s one thing to be told, or to read, about the risks and dangers of CPR; it’s quite another to see a graphic representation of what the process and its more often than not ill effects are. For that, we thank Dr. Nathan Gray, a palliative care physician at Duke University School of Medicine, who wrote and illustrated a graphic piece about the realities of CPR for Topic, an online magazine. “CPR begins when a heart stops, the last domino to fall on the cascade toward death,” Dr. Gray writes. He illustrates a Code Blue being called, the mechanics and impersonality of the process and the statistics showing how few people actually survive intact. “Until you witness it in person it can be hard to capture the inhumanity of our medical routine,” he writes. He urges the medical community to not let technology interfere with its humanity. The piece is essential reading, and undoubtedly I will be using it in future talks about advance care planning. Ronni Bennett has been writing her blog Time Goes By all about aging, for some time. But I didn’t discover it until several months ago when Kaiser Health News wrote a story about her. Last fall, Bennett’s doctors told her that her pancreatic cancer had metastasized to her lungs and her peritoneum (which lines the cavity of the abdomen) and that there were treatment options but no cure for her condition. Now, if I’d been given this news, my first inclination would probably have been to hide under the covers in bed. Bennett’s inclination, though, was to write about it. And to keep writing, because for her that was a way of better understanding herself. Her hope was to approach the last chapter of her life “alert, aware and lucid,” she said. Reading Bennett is, in fact, like having a great talk with a good friend. She is great company, amusing, touching and honest above all. About what she calls her terrors. About the ridiculous moments (she needs a new heater and thinks, Really? Now?) and the transcendent moments (a carefully guided psilocybin trip that she says has given her a greater sense about life and death). She has a large, avid readership and her honesty has made it possible for readers to share their stories, too. She also posts “The Alex and Ronni Show” — videos of her Skyped conversations with her ex-husband. That’s a question we all need to think about. So, I’m awarding a “Comfy” to Ronni Bennett for the great service she is doing for all of us. Do you have any suggestions for “Comfy” awards? I’d love to hear about them! Hawaii has become the latest state to enable medical aid-in-dying, and public opinion has been shifting more in favor of it in the past couple of years. It’s still an enormously controversial subject and too often advocates on both the “pro” and “con” side shed more heat than light on it. I wrote this blog piece for http://sixtyandme.com in hopes of providing a little light. Spoiler alert: I am opposed to medical aid-in-dying. Not for religious reasons, or because it violates the medical principle of “do no harm” or even because of fear of the “slippery slope” that would harm the most vulnerable among us. In short, it seems to me that this evolution is more of a striking and continuing indication of the sorry state of end-of-life care currently, than it is a rational health care solution for those suffering terminal illnesses. Happy National Healthcare Decisions Day! Actually, it’s a whole week, starting April 16. The Day was created to remind all of us of the importance of having a conversation with our family and friends about what kind of care we’d want, if we couldn’t speak for ourselves; and of having a written advance care directive and a health care proxy to speak for us. 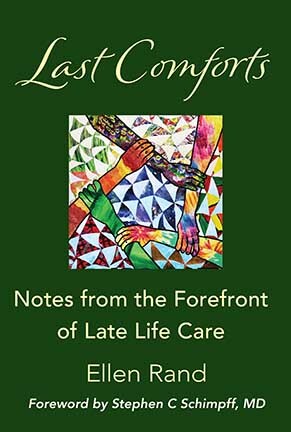 And, in honor of the week, my book, “Last Comforts: Notes from the Forefront of Late Life Care,” is now available in all e-book venues – Kindle, Nook, iBooks, Kobo and more — for the new low, low price of $5.99! It’s a good week to think about your bucket list, too, which I wrote about in this Sixtyandme.com post. Personally, I’ve never been a fan of the idea of coming up with a bucket list. At heart, and I’m sure I’m not alone in this, my clear preference is to focus on the less spectacular but just as satisfying smaller pleasures of daily life. And being grateful for the sometimes unexpected joys to be found there. The photo accompanying this post is a good example of what I mean. I’m sure that seeing the Grand Canyon is probably atop lots of bucket lists. My husband and I were fortunate enough to be able to visit the South Rim a couple of years ago and of course, it was breathtaking. But here was my favorite moment (although the photo doesn’t do it justice). We had emerged from lunch around the same time as a heavy rain had stopped and there – so close you could practically reach out and touch it – was a rainbow. An unexpected, once-in-a-lifetime vision. But my bucket list skepticism changed before I read about research conducted by the Stanford Letter Project at the Stanford University School of Medicine. As Dr. VJ Periyakoil, founder of the Stanford Letter Project, pointed out in a compelling opinion piece in The New York Times, it’s important not only to write down several things you’d like to accomplish, experience, see or share – and update your list from time to time as your feelings change – but also to share this with your physicians. Why? Because they need to know what’s important to you if they are going to provide the best possible care for you, the individual. Rethinking the bucket list question, I considered another reason why sharing your list with physicians is an excellent idea. The truth is, so much of thinking about advance care planning and preparing advance care directives has to do with what we don’t want. CPR, yes or no? Feeding tubes, yes or no? Mechanical ventilation, yes or no? The bucket list, on the other hand, is a clear roadmap for our loved ones and physicians to understand what we do want. So it can be a lovely, positive complement to the admittedly sobering and potentially unpleasant work of envisioning our end-of-life care preferences. I recently came across this short poem on Twitter; it was written by a 99-year-old woman, a former nurse herself. I thought it was so wonderful that I’ve now used it several times to introduce my talks about late-life care and advance care planning. Since people have been requesting copies, I thought I’d share it here. What do you think? Happy Halloween, boys and ghouls! We’re surrounded by all things spooky and macabre right now, so it seems like a good time to ask: what scares you? Truth be told, I found these creepy creatures shown here pretty scary when I saw them at the otherwise great Portland Art Museum in Oregon. Something about their fierceness and intent. But I’ll tell you what scares me more. It’s the idea of living-but-not-living; that is, having to rely on a ventilator, and artificial feeding, to keep me among the “living” if I’m otherwise close to dying. Like being in suspended animation. It’s one thing to consider life-prolonging treatments in the abstract; even checking the boxes on an advance care directive or a POLST form can seem like an abstract exercise too. But an outstanding article by Sara Manning Peskin, MD, recently brought home to me once again the grim specifics of these treatments and tore away anything abstract in considering them. Why is it so important to understand this on a gut level, rather than as a cerebral exercise? Over the past year, I’ve had the opportunity to speak to a number of groups about advance care planning. What I’ve come to realize, though, is that for many people, it’s hard to think about what they might want, or not want, because they don’t understand the realities of what’s involved with various life-prolonging treatments. So I try to explain some of the highlights, with the important caveat that I’m not a doctor or an advanced practice nurse. Even so, I’m sure for many these are still abstract ideas. That’s where Dr. Peskin’s article comes in. She writes about meeting a 56-year-old woman she calls Geraldine, and her family, in the hospital three weeks after Geraldine had suffered a heart attack. Geraldine was on a breathing tube. Her family decided that, because Geraldine was stubborn and exceptional in life – a fighter, they called her — they believed she would be exceptional in beating her prognosis too. “For Geraldine’s family, the immediate fear of watching her die outweighed the unfamiliar pain of sustaining her on machines and watching her disappear in a long-term care facility,” Dr. Peskin writes. And so the breathing tube was placed in her neck, and the feeding tube in her stomach. But, as Dr. Peskin explains, “immobility leads to complications: infection, blood clots and bedsores. Where tubes are inserted, bacteria can enter. Being immobile also put Geraldine at risk for pneumonia and urinary tract infections. “Like mosquitoes in standing water, infections proliferate when the body is still,” Dr. Peskin points out. Blood clots resulted not only from immobility but also from Geraldine’s body having been inflamed and torn from the heart attack. Circulation slowed. “Pools of static blood dried into a thick paste in her blood vessels,” the doctor says. A bedsore developed. As Dr. Peskin explains, if a bedsore progresses, first the skin becomes red, then its outer layer breaks down, then the inner layer does. Then, bone, muscles and tendons are exposed. This can happen in a matter of days. But two months after the heart attack, Geraldine was stable enough to leave the hospital’s ICU and was transferred to a long-term care facility. She was in a persistent vegetative state, which means she did not respond to external stimuli. The family still hoped that there would be a miraculous turnaround. But there wasn’t any miracle. Geraldine died of sepsis, a life-threatening complication of an infection, after four months of care. A coda to the story: While Geraldine was still in the ICU, Dr. Peskin reports, another doctor asked if the family of another patient in that ICU could visit Geraldine to see what prolonged dying looked like. The family agreed; the visiting family subsequently chose hospice care for their loved one. When you think about advance care planning, then, think about Geraldine. I think it’s also helpful to think not only about what you don’t want, but what you do want. It’s still an exercise, to be sure, because so often we truly do not control our end-of-life circumstances. But it’s good to have an ideal in mind. Recently I had a chance to see how the human heart and spirit can overrule the rational mind, even in hypothetical circumstances. At a local educational event on palliative and hospice care, a woman in her 80s in the audience was attentive and engaged during the presentation. During the discussion that followed the presentation, she talked about how she wanted to look into becoming an organ donor. But then, she asked the experts if her heart stopped and if she had decided to opt for CPR but it didn’t work, “Can’t there be a miracle?” In other words, before being pronounced dead, couldn’t there be some other way to revive her and enable her to live on? And would she be pronounced dead before her miracle kicked in? We all want miracles, do we not? We want to have hope when all evidence points to the contrary. That’s why I found her question so poignant, so human. This woman, who had at first seemed to be a realist regarding the question of mortality – accepting it on an intellectual level – was at the same time wandering in the realm of magical thinking. We’re all susceptible, truth be told. But there are a few things to keep in mind to avoid wandering into this realm ourselves. Wishing you all a wonderful start to summer, this coming weekend!